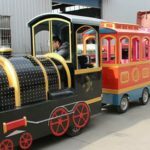 When you go to a carnival, state fair, or even over to Disneyland, you will often see people being driven around on what is called a trackless train. 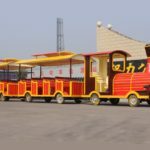 They come in many different shapes and styles, sometimes mimicking popular television shows, all designed to give people a ride throughout the amusement park area. The way that they look can dramatically vary from something that is very basic to an exceptional design mimicking a cartoon. 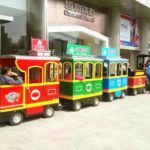 Once you have ridden on one, you will see why they are so popular, something that you may like even if you are an adult. 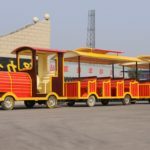 Let’s go over the reasons why trackless trains are so popular with children, and a little bit about their history. 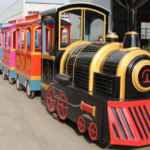 What Exactly Is A Trackless Train? These are tiny trains, at least comparatively speaking, that are very similar in design to a regular locomotive. They can be very small, being pulled by what might be a simple tractor lawnmower, all the way up to a miniature locomotive that is able to go over the ground on wheels. They are called trackless trains because they do not ride on a track. They have rubber tires just like a regular vehicle. They are trains not only because of how they look, but also because of their ability to take passengers from one location to another. Similar units have been seen at airports taking people from one area to another, but the ones that a carnival or state fair tend to be the most memorable. Let’s look at a little bit of the history of the trackless train, and then discuss why kids love them so much. These trains more than likely got their start in the early 1900s, referred to as a Tschu-Tschu train or something similar. Some people today call them a Dotto train, and are called trams if used in parking lots or airports. The technology that powers them used to be combustion engines, but this as solely gravitated toward an electronic design. This is much more convenient to use in an enclosed area, and it makes them much more quiet. 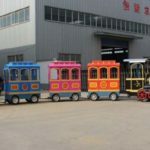 Trackless trains pull multiple carriages or trailers, capable of pulling up to 40 people at a time in most cases. They have a steering will just like a regular car, complete with an accelerator and a break, and were probably designed for practical reasons such as public transport whereas they are now more well-known as an attraction at an amusement park. 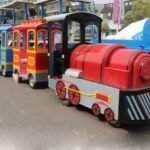 Why Do Kids Love Trackless Trains? There seems to be a common draw that kids have to trains. It could be their appearance, the noises that they make, and how they may mimic certain cartoons that are popular on television today. They might like the idea of being the conductor, or at least getting a ride in a train which they may have never done before. 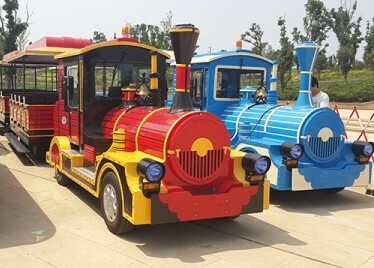 By most accounts, it is the design of the train that motivates children to want to get on them. There are many popular train cartoons, or perhaps they simply like the bright colors. Adults are even fond of riding on them from time to time, especially if they have been at an amusement park for several hours and they really do not want to walk all the way back. The trackless train will more than likely always be an attraction that state fairs, carnivals and amusement parks. They have both practical and fun attributes, ones that are typically appreciated more by children than by adults. 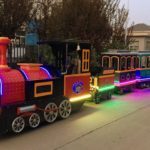 Whether you decide to ride one that looks like a traditional locomotive, or one of the more expensive models that mimics popular cartoons on TV, it will give you a little break from the fast and furious rides that are typically found that amusement parks, allowing you to relax, and as they say, enjoy the ride.